Hey there everyone, happy Thursday! The weekend is creeping up upon us all, and in the hopes of adding some positivity until we get there, I’ve got some space game news to drop on y’all (yeeeah, makes no sense, leave me alone, I’m reallyyy tired. ;). That said, here’s today’s news! There is now a demo for Drox Operative. Wait, why are you still here? You thought I was gonna say more? GO GET IT AND PLAY IT DAMMIT! ;) I’ve talked about it plenty, so now you can see what the fuss is all about. Also in happy news, the Kickstater for Star Citizen has passed $1,000,000! This now unlocks the Idris-class corvette — the largest playable ship in the game — and gives some more in-game money to all backers. There’s also an update from Chris Roberts announcing that their combined crowdfunding efforts have reached $3,000,000! Congrats to them! Strike Suit Zero also has happy news on their Kickstarter, as they’ve reached the $130,000 stretch goal allowing mod tools to be released! Awesome! Over on the Kickstarter for Elite: Dangerous, David Braben has chimed in saying that new material, including a video, will be going up on their Kickstarter page tomorrow. I await with bated breath. Over on Space Sector, they have a look at the recently released beta spacey defense game, Solar War. The blog for Galaxial has an update on the progress of the game, which include galaxy changes, new jumpgates and more. One of the devs for FTL got bored without power, and created a “big bead sprite” of the Kestrel, which you can see on their Twitter. Finally in gamey news, the Kickstarter campaign for StarJacked: The Adventure Begins has been launched. Again. Not sure what happened but they’re calling it a “reboot”. Finally, on the Concept Ships blog, there are some fantastic designs courtesy of Jason Stokes. That’s all for today my friends! Thanks for visiting and reading, and have an awesome day! Hey, thanks for the usual excellent daily news scoop! What would Braben present, I wonder. Never tried Drox – now is the time to check if I was wrong, downloading the demo. By the way, I know, it’s not in your fromat, but Firefly studios has just released Space Colony HD – a remake of their space colony building strategy. Never played it back in 2003, but since it’s only $8 or so, I’m thinking to try it out too. I really liked the concept art presented in the video – very stylish yet surprisingly close to the original ship design. And what is even more interesting is the interior shots. Looks like they might aim to make interior seen through the blast holes during fight – somethiing I’ve been dreaming to see in a space sim for a loooong loooong time. Overall, Braben speech was very weak. Half ov it was simply voicing over the initial written pinch. And If he has had the concept of this game in his head for years, like he says, it sure must be crystalized to some strong clear idea. Not his meekish bunch of “maybes”. “Exploring is amazing, we will have exploring”. Co-op id amazing, we will have co-op, _maybe_”. Damn, I feel like he’s trying to sell me some soap or shower gel with some hidden unknown side effects. Oh, and I just realized: haven’t seen any news from the Egosoft team about their X Rebirth project. And it was supposed to be out in 2012! Do you have any new info on hem? Wow, Brian, thanks for mentioning Solar War. Got a demo of it and it reminded me of Stars! immidiately. The header pic is basically what pops into my head whenever I see a new daily compilation post. 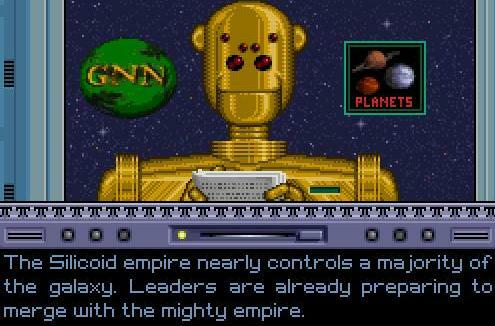 All the latest space game news read by your friendly neighborhood GNN robot! LOVING the demo for drox operative! Thanks for the heads up. Gets a little choppy on this netbook, but still great fun. Loved Din’s Curse, the Space/4x setting is even more amazing. Emergent gameplay is pretty much my favorite thing. Yaaay! So glad you’re enjoying it!